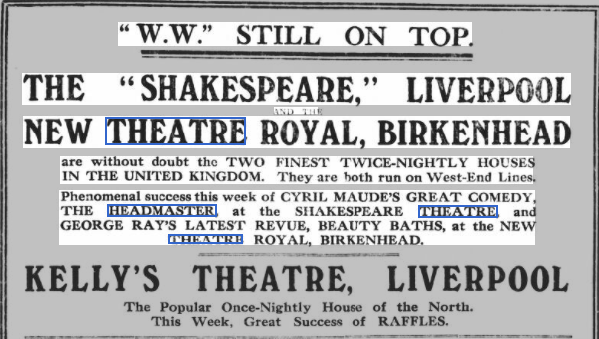 From The Liverpool Echo - Tuesday 31 August 1915. Taken from the Devon and Exeter Gazette of 2 November, 1916. From The Era - Wednesday 08 September 1915. 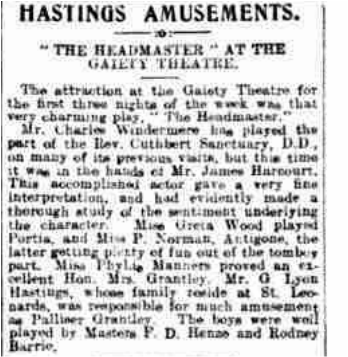 An article from the Hastings and St Leonards Observer of 9 October, 1915. From The Lincolnshire Echo of 4 September, 1915. 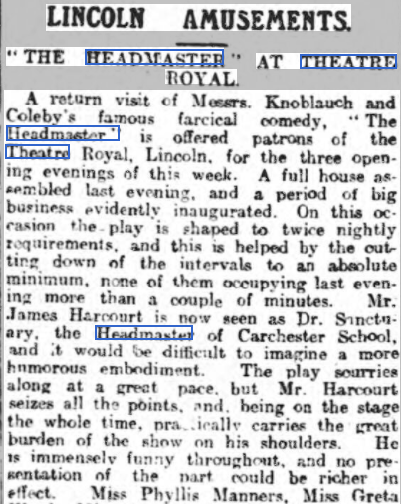 A return visit of the amusing comedy The Headmaster billed for the first three evenings of next week at the Theatre Royal, Lincoln, seven and nine o’clock. Mr. Dudley Stuart’s Co. are responsible for the production of the play, which had such a successful run the Playhouse, London. Very human, delightfully fresh, laughter, and cleverly constructed is “The Headmaster.” Seeing one of the authors, Mr. Edward Knoblauch, is partly responsible for that charming play “Milestones.” and also the weird and interesting "Kismet”, added to which the other author Mr.T.W.Coleby, a writer of distinction, it is not surprising that such a success is scored with "The Headmaster", which is full of delicate touches, smart dialogue, and amusing situations. We are told the King and Queen, together with the Royal guests, laughed heartily when this was played before them at Balmoral Castle. Such production appeals to the highest intelligence. Mr. Stuart is to be congratulated upon his company which is an excellent one. and includes Mr. James Harcourt, who plays the title-role in truly humorous manner, but when occasion arises, as it does in the last act, he proves himself not wanting in emotion, and altogether gives a clever and consistent impersonation. 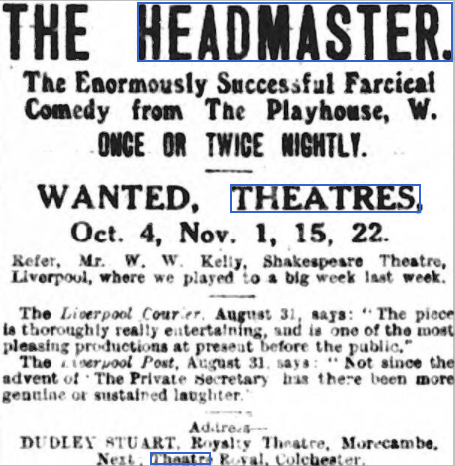 From The Liverpool Echo of 31 August, 1915. A refreshing comedy, "The Headmaster.' Its pleasant grip is unslackened all through. Mr. James Harcourt finds in the title part a well of exquisitely flavoured humour. He bears hie audience along with his laughter making, touching them now and again with a vein of tender feeling. A winsome Portia is Miss Greta Wood; Jack Strahan Mr. W. Mackay seems to hardly realise the authors' conception; while Miss Manners' portrayal of the Hon. Mrs. Grantley's peculiarities suffers a little from over emphasis.These slight faults apart, the comedy is played admirably, and offers an enjoyable evening. "The Headmaster" is here this week, causing much laughter. presented Mr. Dudley Stuart’s company. Prominent in the company is Mr. James Harcourt. whose Rev. Cuthbert Sanctuary is an altogether fine conception and provocative of continual laughter. Miss Phyllis Manners makes a particularly amusing Mrs. Grantley; praise due to Mr. Tom Tindall for his Rev. 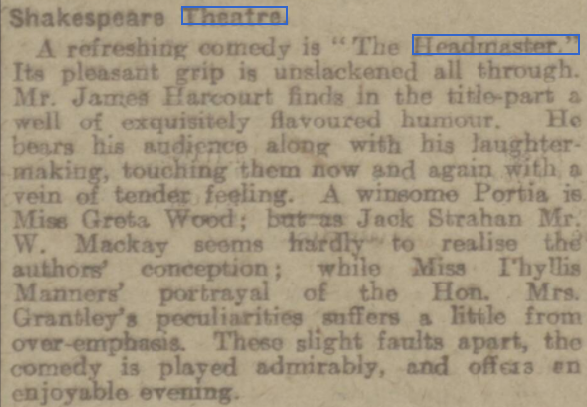 Wilton; and other good supporters include Messrs. W. MacKay (Strahan), Richard Clark (Munton), and the Misses Greta Wood (Portia), and Anna Cuka (Antigone). From The Lincolnshire Echo - Tuesday 07 September 1915. Interesting to note that Greta Wood was actually named as Greta Ward! From The Era - Wednesday 01 September 1915. 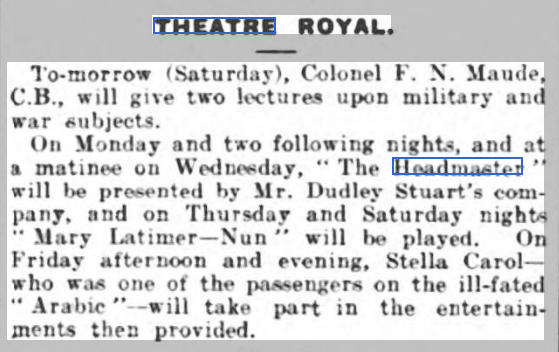 From The Leamington Spa Courier - Friday 01 October 1915. 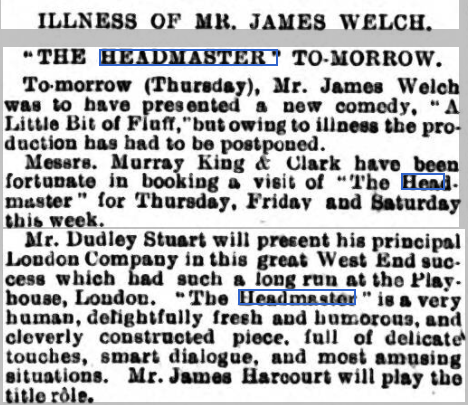 From The Eastbourne Gazette - Wednesday 06 October 1915.